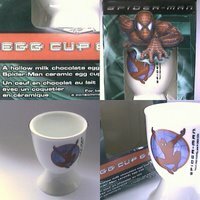 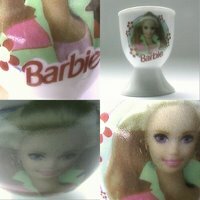 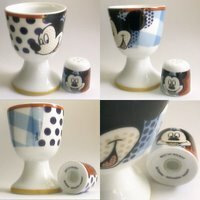 How can a very normal egg cup be transformed into a highly desirable and/or collectable object? 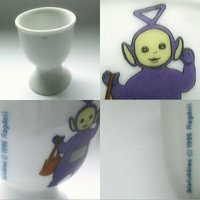 Try putting a picture transfer of a world famous TV or cartoon character on it. 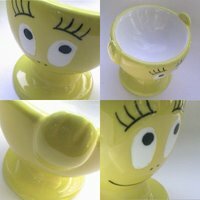 If impossible, a locally famous TV or cartoon character might work as well. 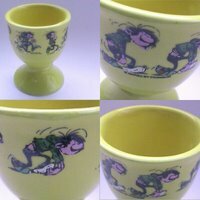 In the current selection we can see some exemples of egg cups with transfer pictures of famous or supposedly famous characters and, as you can observe, not all the transfers have been put on common shaped egg cups. 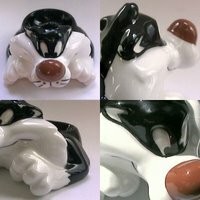 Which means that some imagination could be at play here to. 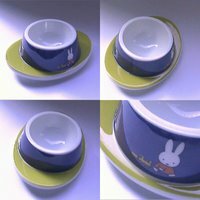 At least potentially. 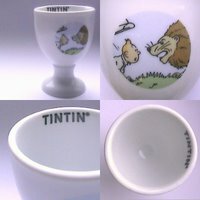 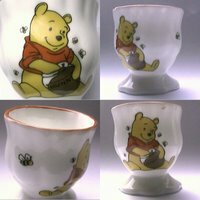 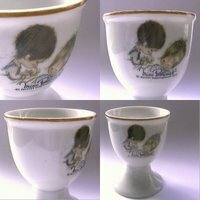 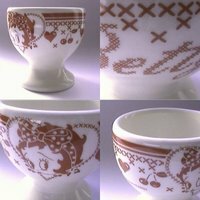 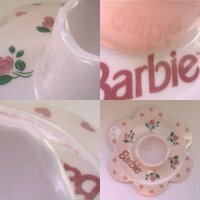 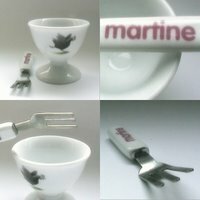 Known details: 1) Miss Petticoat [eggcup0191]; 2) Martine [eggcup4101]; 3) Tintin [eggcup4060]; 4) Popstar Mickey Mouse egg cup, produced by United Labels AG [eggcup4102]; 5) Winnie-The-Pooh [eggcup3366]; 6) Tinky Winky from the Teletubbies [eggcup3360]; 7) tiger and rabbit from Winnie-The-Pooh, made in Thailand, sold only at Disney Stores [eggcup3449]; 8) Barbie, made in China for Spearmark [eggcup2277]; 9) Barbie [eggcup3361]; 10) Betty Boop, 1999 [eggcup1469]; 11) Spiderman, produced by Kinnerton, 2002 [eggcup2996]; 12) Miffy, made by Mepal Rosti [eggcup3103]; 13) Gaston Lagaffe [eggcup1480]. 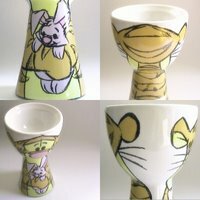 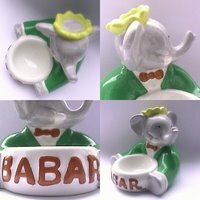 If you like egg cups featuring famous characters, you could be interested in checking the Tropico Diffusion egg cups post, where you'll find egg cups like the Sylvester The Cat one, the yellow Barbapapa one or the Babar one, as well as many others.